If you’re coming to Hawaii with kids, you probably want to expose them to some of the island’s beauty – hikes, waterfalls, and exotic flora. But knowing which hikes are suitable for different age and skill levels can be a challenge, especially if you have never been to Hawaii before. Some of Hawaii’s hikes are long, muddy, or downright dangerous. The last thing that you want to do is bring you children on a hike that is too steep or too long. Of course, every family is different, but the hike that I always recommend to families with kids – no matter their ages – is Waimea Falls. I’ve done this hike more times than I can count with people of all ages, and it’s always a hit. This hike has it all – a beautiful trail, cultural activities for children along the way, and a rewarding waterfall at the end that you can swim in. Waimea Valley is not an off-the-beaten-path kind of place. It’s no secret, no hidden gem — but the touristy aspects of the trail are what make it perfect for keiki (Hawaiian word for children) and an adventure worth going on for the adults. Waimea Valley has been a sacred place for more than 700 years of Native Hawaiian history. Known as The Valley of the Priests, descendants of the high priests lived and cared for much of the valley from 1090 until 1886. 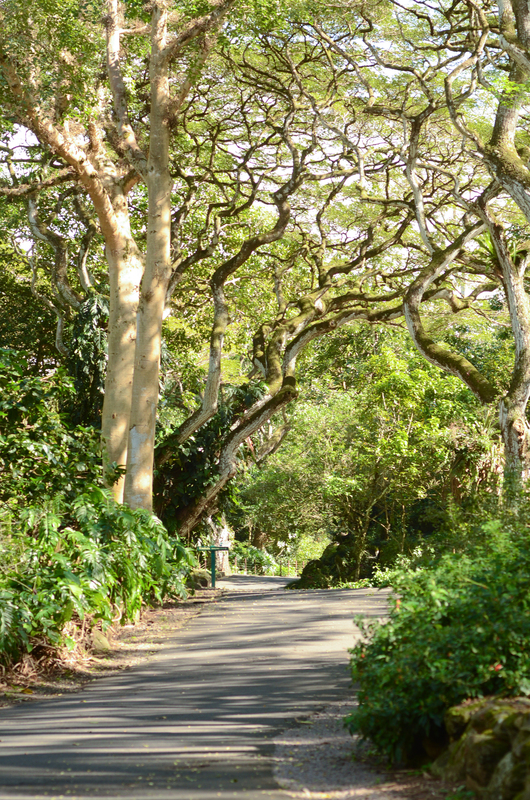 The paved trail to the 45-foot Waimea Falls is easy to walk on and perfect for strollers. At .75 miles each way, it is also relatively short. A golf cart shuttle is also available for an added fee, making this trail very accessible. Some families walk to the waterfall and choose to take the shuttle back to save time and energy. After you enter the parking lot, you first will encounter a visitor center, snack shop, and gift shop. 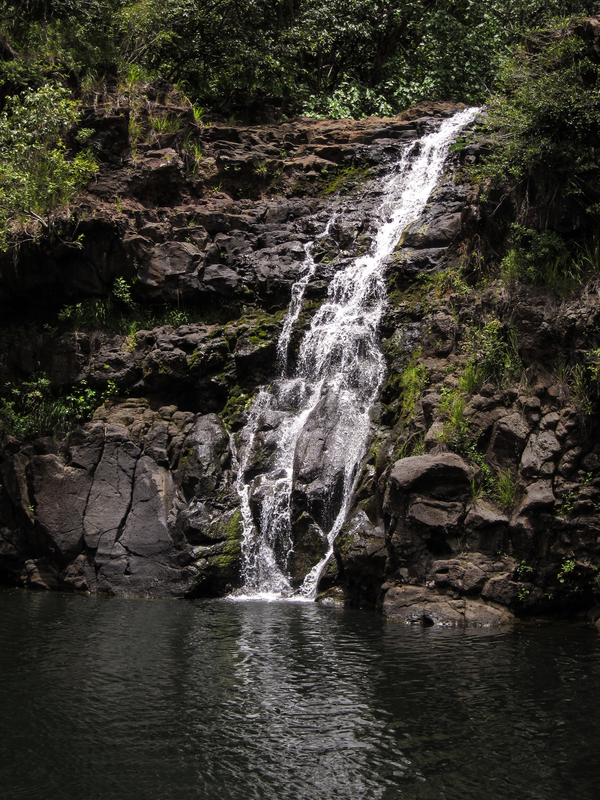 You don’t have to purchase tickets to enjoy these aspects of Waimea Valley. And if you’re lucky, you might see one of the resident peacocks that stroll around freely. After you purchase your tickets ($16.00/adult; $12.00/senior; $12.00/student; $8.00 ages 4-12; military discounts available), a paved trail will lead you to the waterfall. The paved trail at Waimea Valley is .75 miles each way and is suitable for children and strollers. The best part about this short trail is that there is so much to see and do along the way, for both adults and children. The activities that break up the trail are a great way to introduce children to both hiking and Hawaiian culture. With your paid admission, you gain access to many of the site’s daily cultural and hands-on activities. Activities include hula lessons, traditional lei making, Hawaiian games, crafts, music, and storytelling with kupuna (elders and a source of knowledge). As a botanical garden, Waimea Valley hosts flora as well as rare and endangered species from all over the world. First, you come across Hawaiian flora and hibiscus hybrids. On the opposite side are ku’ula stones, a shrine dedicated to the god of fishermen. As you continue along the trail, you will also find the kauhale, an ancient traditional Hawaiian living site. Stop by Hale Kipa, and a kupuna will teach you and your children about life in Hawaii through demonstrations of Hawaiian artifacts, songs, dance, and crafts. This area also has plants from Guam, Hawaiian flora, food plants, and a medicinal garden. Next, there is a huge banyan tree. Of particular interest just past the banyan tree is the Ogasawara Islands section. The Ogasawara Islands are a World Heritage Site. Waimea Valley is the only other place in the entire world that many of the plants endemic to Ogasawara grow outside of the Ogasawara Islands, making this section a real treat. Keep walking, and you will come into the Hawaiian Games Site. There are two different kinds of games here. The games of skill include ‘ulu maika (rolling stone disc), moa pahe‘e (dart sliding), and konane (Hawaiian checkers), which will test skills of accuracy and strategy. Quiet Time Games are games meant to be played by individuals or small groups, including pala‘ie (loop and ball), hu (kukui nut tops), and kimo (jackstones). From here, it’s not much further to find the waterfall. Enjoy Central and South American flora, and ginger, among others, along the way. Once you get to Waimea Falls, there is a restroom and another snack bar. Lifeguards are always there to hand out lifejackets and to watch everyone who is swimming in the falls. The waterfall is 30 feet deep, and no one is allowed in without a lifejacket. Some days, when the water is rough, no one is allowed to swim inside the waterfall. Don’t forget your water shoes! It’s quite rocky to get into the waterfall. A waterproof camera is a must here, too! Waimea Valley also hosts many different events throughout the year. From May-October, Moon Walks at Waimea Valley are a way to honor Mahina (the moon) and its significance to Hawaiian culture. Although Waimea Valley is about an hour from Waikiki, it’s worth the trip. When you book your vacation through Hawaii Aloha Travel, be sure to mention you’d like to visit this extraordinary place. Our travel agents will make sure it’s on your itinerary and will help you find other things to do in the area.